Places are already filling up. Enquire obligation free today! Fri, 07 Sept : Transfer from Punta Arenas to Puerto Natales hotel. Mon, 10 Sept : Choose between a trek to Base of the Towers, or a Nature Walk to Laguna Azul. For an unforgettable marathon experience, come to one of the most majestic places on Earth with Eclipse Travel to Patagonia. 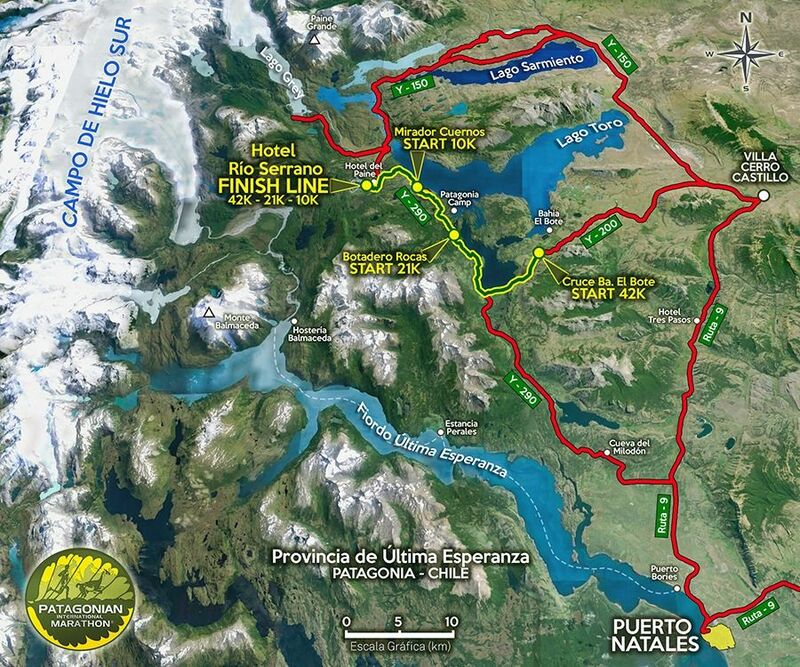 In late September each year the Patagonian International Marathon takes place in Torres del Paine National Park, Chile. As Australia’s official partner with the organiser NIGSA Events and specialists in South America, Eclipse Travel will organise your trip to comfortably get you to and from Patagonia in relaxed and trouble free travel with some recommendations to visit some of the breathtaking scenery and destinations nearby. We know first-hand all the properties within Torres del Paine National Park and can arrange all of your transport to / from the event and any other destinations you would like visit in South America while on your journey. Travel packages including flights can be arranged in 3, 4 or 5 star style so just let us know what you prefer and we can do the rest. The Patagonia Marathon is held in the freshest air in the world, within the spectacular peaks and glaciers of Torres del Paine National Park. Marathons do not get any better! On September 8th, runners from around the world will be flocking to beautiful southern Chile to participate in the 7th annual Patagonian International Marathon, running to raise awareness for the preservation of Chilean Patagonia. The race route has magical and breathtaking landscapes. Mountains of granite and ice rise more than 2,500 meters above the race route. Multi-coloured lakes and wildlife are abundant which include condors, guanacos, foxes, huemul, pumas and rhea, among others. The surface of the race route is a winding gravel road. Another important factor that marks the character of the event is high likelihood of strong winds. The trip begins with you being picked up from your hotel in Punta Arenas or from the Punta Arenas airport in the morning and driven to Puerto Natales, a small, lively town on the shores of “Seno de Ultima Esperanza.” The whole drive takes you past great scenic views and lookouts. Upon arrival in Puerto Natales, you will be dropped off at your hotel and will have the rest of the day to relax and prepare yourself for the race. After your glorious finish, you will be picked up and driven back to Ecocamp. Of course, if you want to stretch out your legs you’re welcome to walk back! During this days you will join our Wildlife Safari program activities, and you will have the chance to choose between treks or nature walks. Trek Cerro Paine: We leave after a tasty breakfast at EcoCamp and head to Cerro Paine, a nearby mountain characterized by its two imposing peaks. This is a demanding trek of 16km with a max altitude of 1200m and an estimated hiking time of 7hrs. Highlights include the lenga forest, mountains, glaciers, the pampa and an unforgettable lookout of the towers and the Ascencio Valley. After taking in one of the most striking views of the national park, we backtrack along the same trail and return to EcoCamp. Nature Walk to Salto Grande & El condor Lookout: After breakfast we head westwards by van, taking a route along the southern shore of Nordenskjold Lake. Our first stop is the magnificent Salto Grande waterfall, with its impressive cascading waters falling from Nordenskjold lake into Pehoe Lake. From here it’s a short walk to Cuernos viewpoint, with a panoramic view of the mighty Horns. From the viewpoint, we drive to Pehoe Lake and begin the two-hour round-trip walk to El Condor Lookout from its shores. We go gently uphill through the steppe vegetation; a great opportunity to learn about the local flora. Here we witness the piercing blueness of Pehoe Lake and the Paine river. On a clear day, we can see the immensity of the Southern Patagonian ice fields in the distance. We reenergize taking in the whole Paine Mountain range and its stunning snowcapped peaks. After a hearty lunch in the perfect location, we backtrack along the same trail and drive back to EcoCamp. Trek to Base of the Towers: After a hearty breakfast we set off from Ecocamp towards Hostería Las Torres and join the uphill path to Ascencio Valley on the Tower’s eastern face. Dry mountain spots, beech forests and small rivers line the scenic walk towards the valley. Our big challenge comes as we climb the steep moraine, a mass of boulders leading us towards one of the world’s most famous views overlooking the Towers. The famous Torres del Paine (2,900 m/ 9,400 ft) consist of three gigantic granite monoliths, the remains of a great cirque sheared away by the forces of glacial ice. After an uphill slog, the Towers eventually come into full view, rising majestically before us, with the glacial lake visible below. Is there any better place in the world to have lunch? After feasting on the view and our picnic, we backtrack along the same trail through Ascencio Valley and return to EcoCamp.